Last year a game was released called Radical Fishing. It was fun, and had a great name, but didn't look so hot. 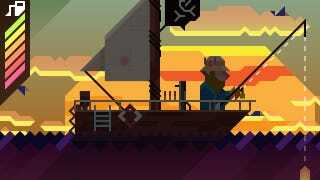 The developers (Vlambeer) are now back with another fishing game, and this one looks great. It's called Ridiculous Fishing, and is a sequel for the iPhone. You're still fishing, only now with some unique visuals courtesy of artist Greg Wohlwend. Why the soon-ish update? Well, as is the way with the App Store, somebody ripped off Radical Fishing and was selling it as their own, so Vlambeer decided to show off their in-development sequel now to head them off at the pass. It'll be out in the "near future". We are also assured it will feature fish wearing hats.